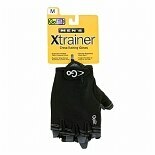 Shop GoFit Men's X-Trainer - Glove Medium (1 ea. )1 ea. 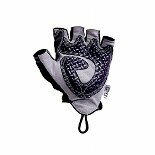 Shop GoFit Women's X-Trainer - Glove Medium (1 ea. )1 ea. Protect your hands while you exercise with workout gloves. Available for both men and women, exercise gloves can help you grip dumbbells, kettlebells and more. Find the size of workout gloves that is a comfortable fit and gloves made of durable material. We carry weightlifting gloves by brands such as GoFit, Fitness by Cathe and Altus Be Fit Look Fit. When you're shopping for workout gloves, find the men's or women's size that meets your need or try an adjustable pair. Some gloves have stitching and special material in the palm of the glove to help improve your grip. Other workout gloves have gel padding in the palm for additional protection. You can also find exercise gloves that have wrist support which can help protect against injury. You can set your home up for workouts with exercise equipment that includes aerobic and weight training machines. We carry a variety of fitness accessories so you can ensure an effective workout. You can also shop for sports nutrition items and weight management bars and drinks here at Walgreens.com.